It’s taken me two hours to write the first sentence of this piece. One hundred and twenty minutes ago, I sat down at my desk, coffee in hand, with the very best of intentions. 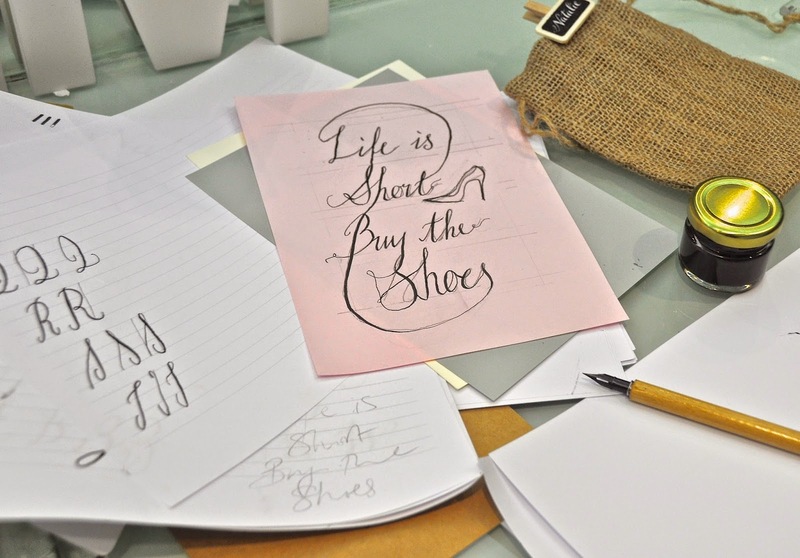 My brain was whirring and I was fired up about the topic of this post – a review of a great workshop that I took part in last weekend. In theory I should have bashed out this piece in record time. So what went wrong? Well, it’s what goes wrong most days when I sit down to work. It starts with a ‘P’ and ends with ‘interest’ and if you haven’t been sucked into the depths of acute addiction already, I urge you to never, never type the fatal URL: www.pinterest.com, into your browser and fall prey to its wicked clutches. If you already thought you were a little prone to procrastination, Pinterest will take that and elevate it to still in your pyjamas at 4pm heights. I pin street style looks, I pin artfully arranged plates of food that look far too delicious to tuck into, I pin beautiful shoes, I pin exotic palm-fringed beaches but most of all, I pin words. Words are my ultimate weakness. I love spirit-lifting quotes, song lyrics, witty soundbites, and snippets of text from my favourite books. But more than that, I love the letters that make up the words. 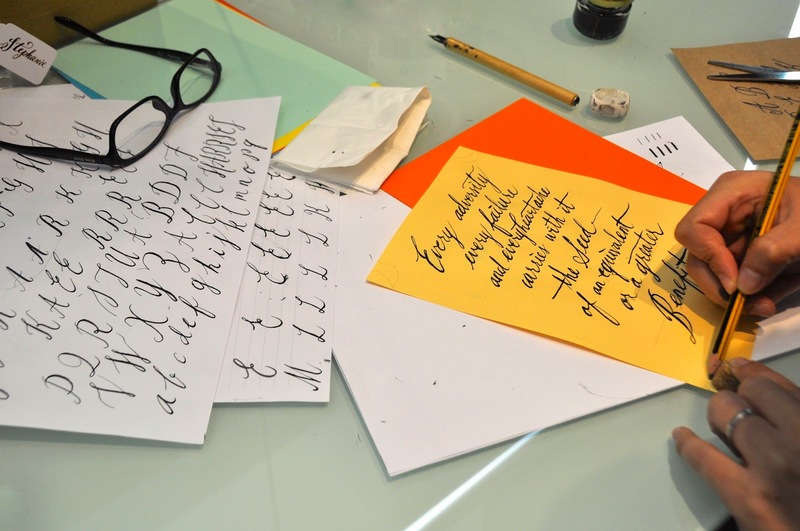 From swooping, flourished ‘a’s to blocky, hard-edged ‘z’s, I’m a total typography junkie. 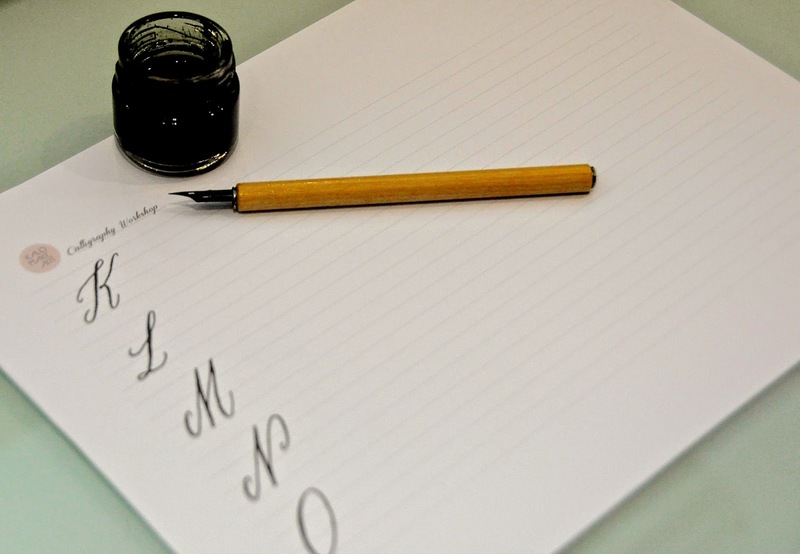 Earlier this month, as autumn began to creep in, and I got that back-to-school feeling, I decided that it was time to take my word love beyond pinning and actually pick up a pen myself. I bought a couple of typography books, hit-up Muji for all my stationery essentials and started YouTubing tutorials. A few frustrated hours later I realized I had all the wrong kit and that swooshy, pretty lettering is much, much harder than it looks. While the Internet’s great for putting a whole universe of knowledge at your fingertips, there are some skills that no amount of virtual tutors can truly teach you. Sometimes, you require an old-school, flesh and bones, teacher of the human variety to get you started. 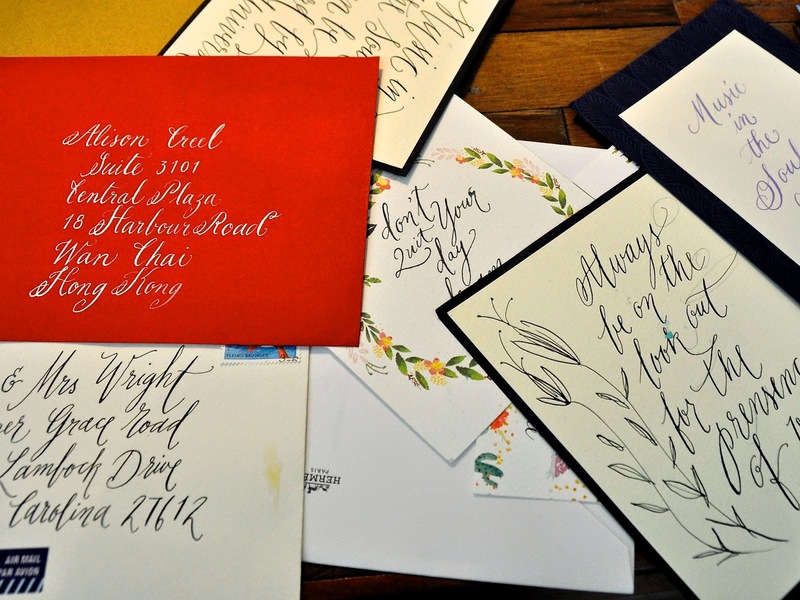 So, it was with unabashed glee that I discovered a living, breathing typography genius based in Hong Kong who offers calligraphy workshops at her studio just a short trot from the heart of Central. 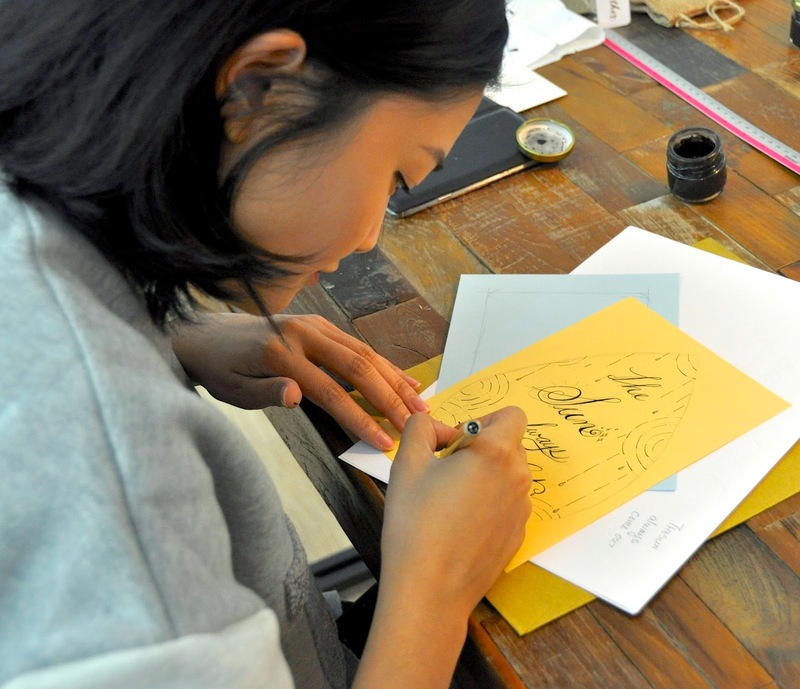 Artist and designer, Kalo set-up her boutique stationery design company, Kalo Make Art, back in 2011 after noticing a lack of companies in Hong Kong offering bespoke stationery design. 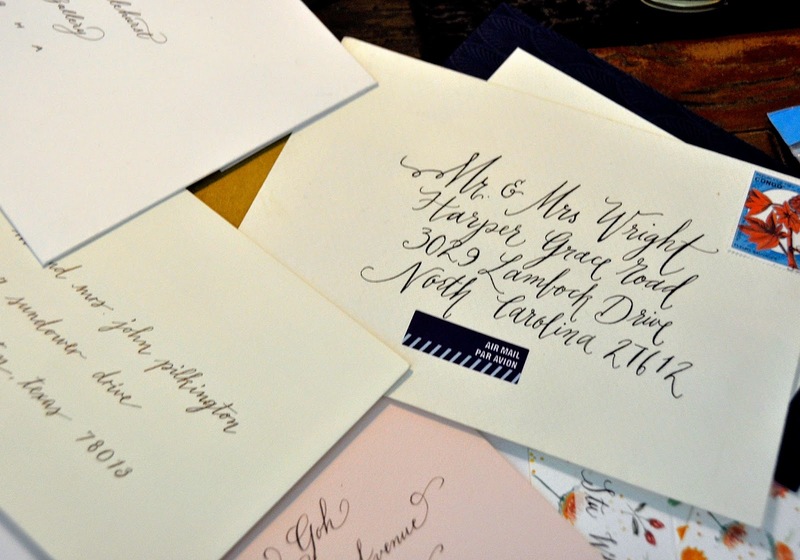 As her business has flourished, so too has her personal passion for calligraphy. 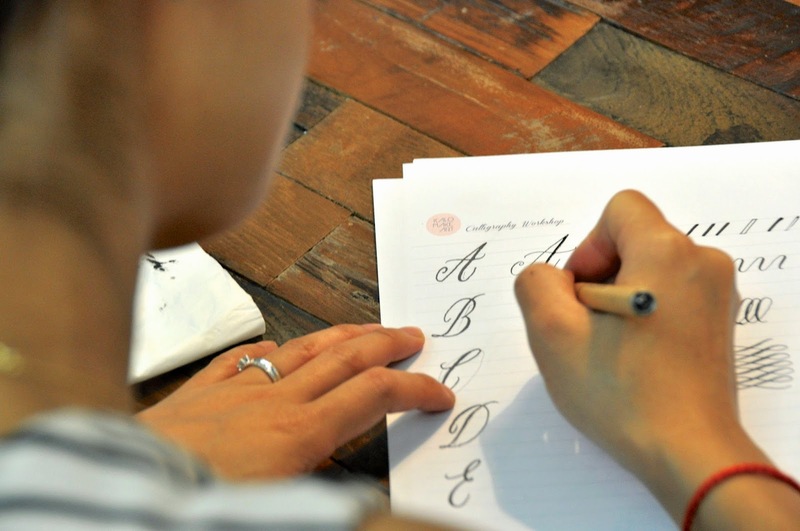 Seeing a growing trend in her customers asking if they could learn to letter as she does, Kalo decided to start offering weekend workshops to introduce the basics to beginners and help the more proficient perfect their skills. I browsed the autumn workshop schedule and decided that the ‘Mini Quotation Poster’ morning workshop was just what I was looking for. The chance to create my very own pin-worthy poster? What more could a pin-addict wish for? I circled the Saturday morning on my calendar and logged straight on to Pinterest to get some Pinspiration. The morning of the workshop dawned and at 10am sharp, I was in Kalo’s studio, a sweet little space in a walk-up set just back from Wyndham Street. 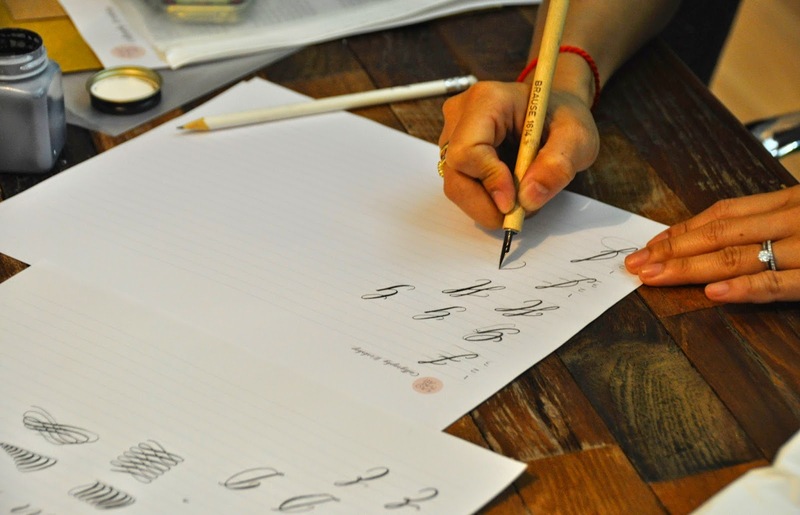 The desks scattered around the room were already filling up with a group of seven other word-enthusiasts, who ran from a make-up artist hoping that learning to letter may improve her creative make-up technique, to a Chinese calligrapher interested in seeing how Western calligraphy differed to her art. Prior to the class, Kalo had emailed reassuring me that I need bring only myself and that she’d provide all the materials necessary for the workshop. 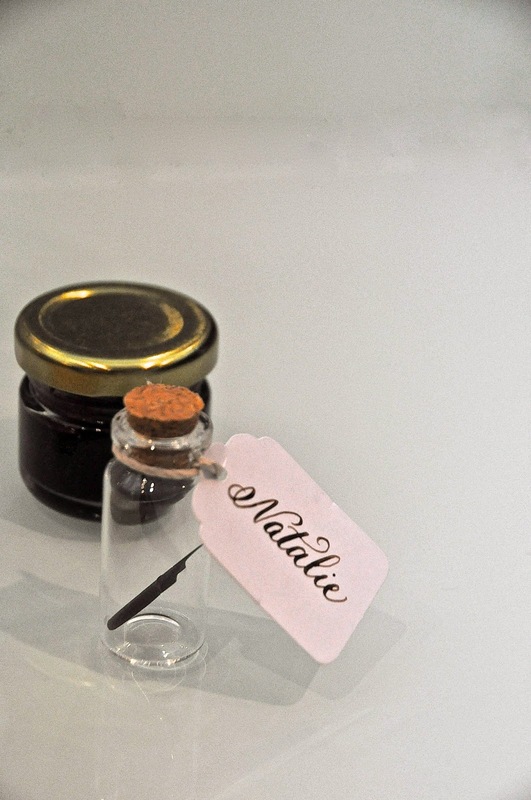 Little did I expect to arrive to a ready-made beginner’s calligraphy kit, mine to keep, personalized with little labels bearing my name in perfectly inked letters. 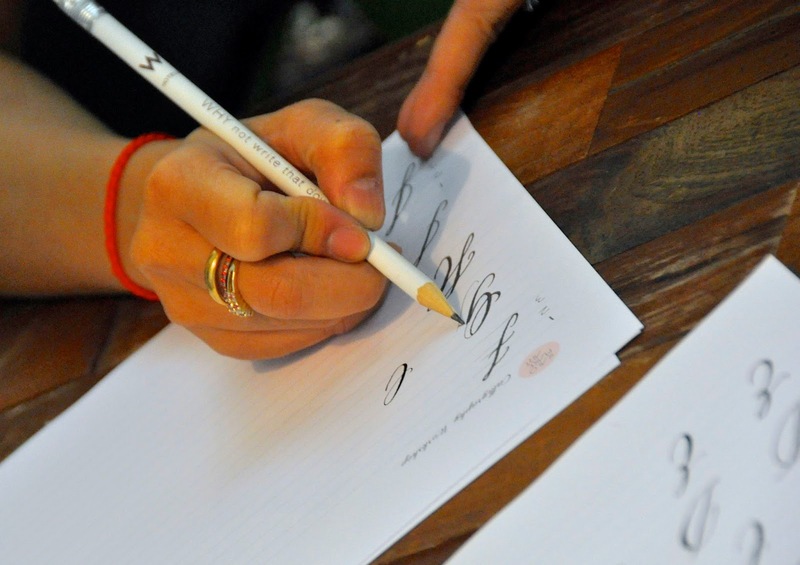 I unpacked my pen-holder and nib, as Kalo demonstrated how to assemble your pen and talked us through the core equipment that every calligrapher needs as well as where to stock-up on supplies in Hong Kong (surprisingly tricky it transpires). 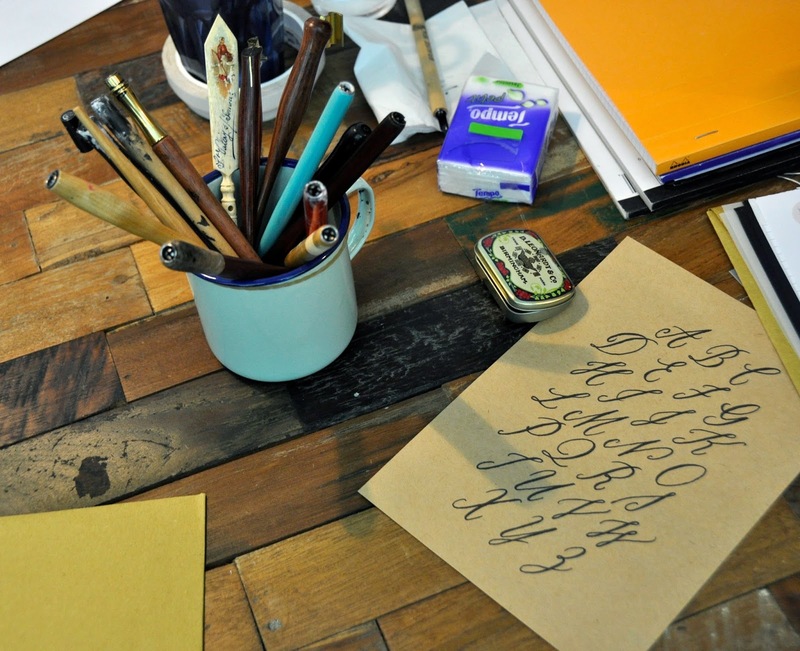 We started the morning by unscrewing our mini pots of ink, loading up our nibs and getting scribbling. Kalo provided us with a stack of paper and urged us to just play with the pens without any instruction so that we could get used to the feel of writing with ink. My paper very quickly became a mess of scratchy letters, ink splatters and bodged attempts to emulate Kalo’s curly alphabet (handily neatly set out in upper and lower cases on take-home cards). My classmates seemed to be getting the hang of things much more quickly than me. Perhaps Pinterest glory was never to be mine after all. 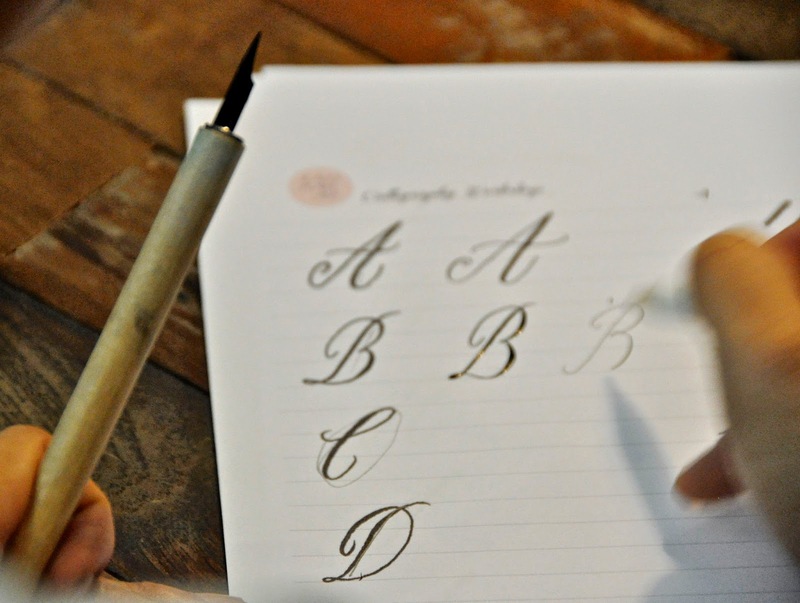 Stage one of practice scrawling complete, Kalo picked-up her pen and began to demonstrate a few simple techniques and practice patterns to help us to get a handle on the calligraphy fundamentals. 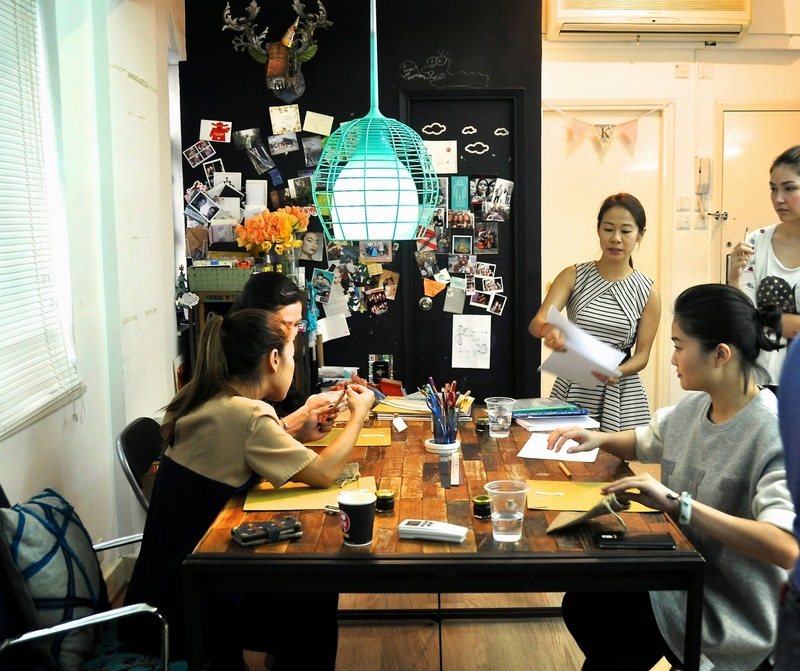 As her pen effortlessly swooped across the page, she carefully explained the next exercise, seamlessly switching between English and Cantonese, so that everyone got back to their practice pads with a renewed energy. Just a couple of practice letters later, we all marveled at how a tiny technique adjustment can cause your lettering to come on leaps and bounds. Gradually inking our way through each character of the alphabet, we each worked in a collective hush of concentration while Amy Winehouse and Jamie Woon burbled away on the speakers in the background. Kalo circulated patiently correcting a swoosh here and an angle there, offering tips and letting us in on all her typography tricks. Despite the fact that great calligraphy is clearly an artform that requires hours and hours of hard graft to perfect, by the time midday rolled around, I felt just dexterous enough to have a crack at designing my mini quote poster. We gathered around a selection of Kalo’s work fanned out on the desk in the centre of the studio as she walked us through the bare bones of the design process. Suitably inspired, I picked a few sheets of paper from a veritable rainbow of choice, grabbed my ruler and pencil and got started on my poster. 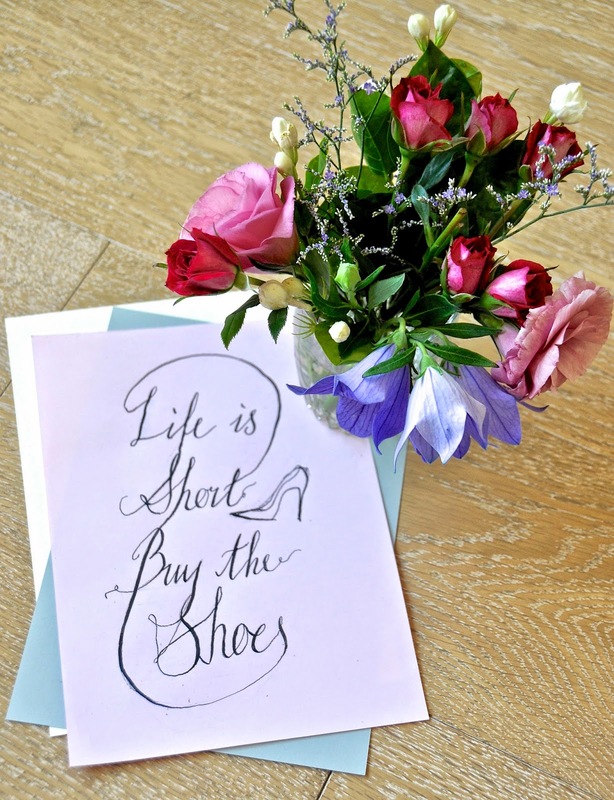 After a substantial amount of Pinterest research, I’d come armed with one of my all time favourite quotes: “Life is short. Buy the shoes.”. Pretty deep stuff. Plenty of sketching, erasing, resketching and resketching again later, I picked up my pen and painstakingly began to ink my design. The end result may be a long way from Pin-perfect but I was still pretty proud of my progress in just a couple of hours. 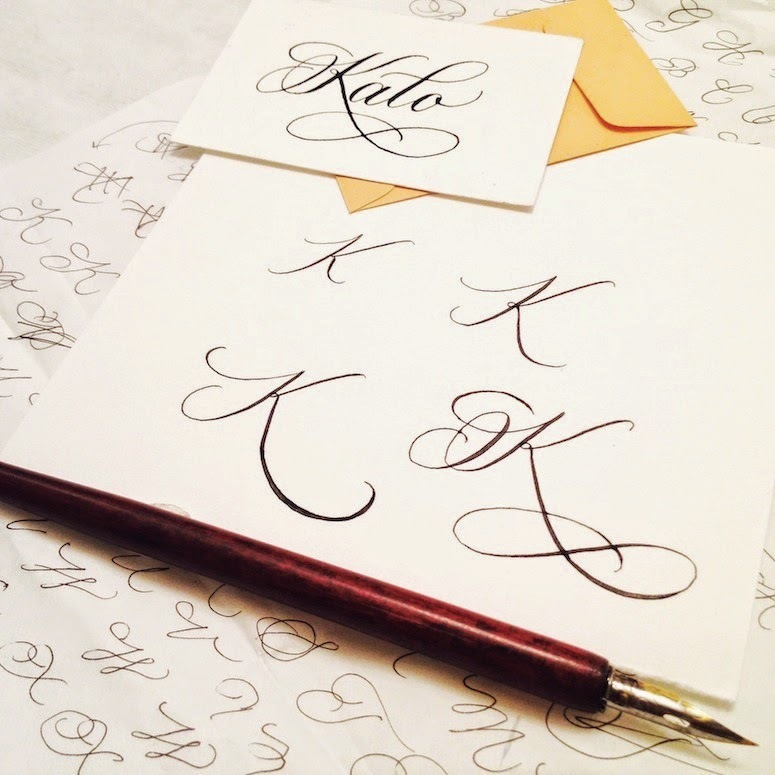 Kalo is so passionate about calligraphy and so super-talented herself, it’s impossible not to leave her studio feeling fired-up about your burgeoning skills and ready to put your beginner’s kit to good use once you get home. 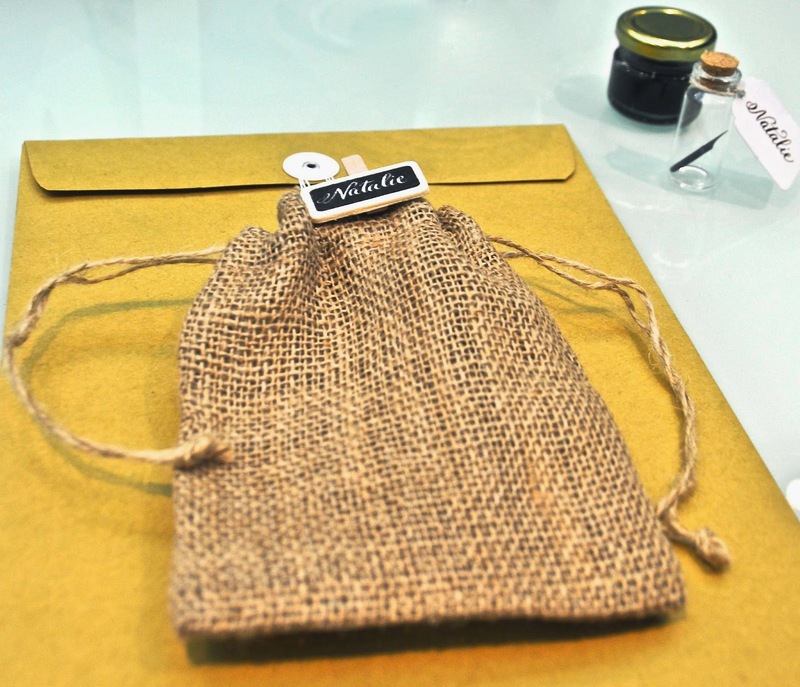 Whether you’re getting married next summer and fancy inking the invitations yourself, or you just want to try your hand at something new, I guarantee a few hours with Kalo will be a weekend morning well-spent. For me, while I know it’s going to be a long, long journey to calligraphy brilliance, I’ve already made good inroads into my practice notebook and nearly need a new pot of ink. 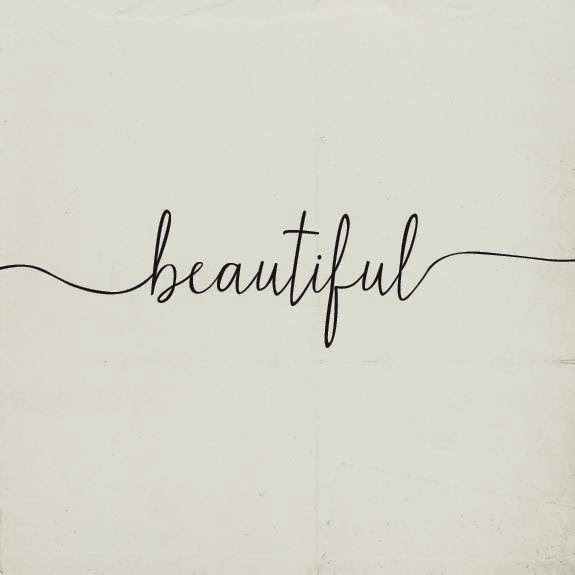 But, best of all when I pinned pretty collections of flourished letters this morning, it was with a new more-educated eye and all that pin-crastination is now completely justified – I’m honing my art. 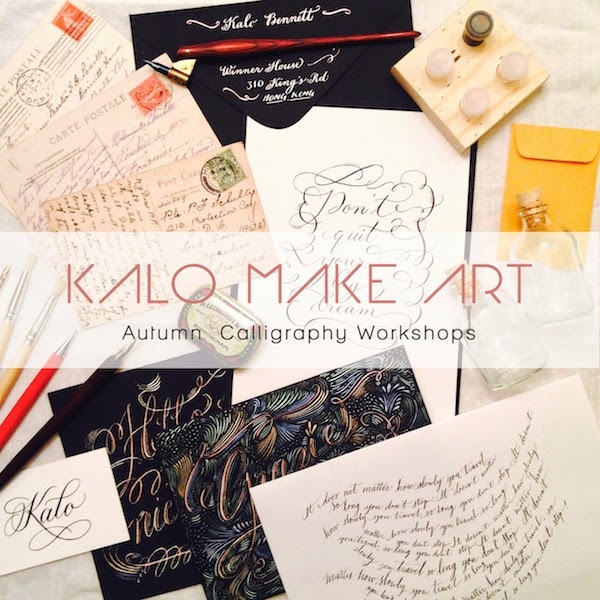 For details of the rest of the autumn workshops check out Kalo's workshop schedule.